If you need a reference for the Secret Screen parts, click here. Instructions for French door installation are here. Tools you will need to install Secret Screen: 1) a medium size phillips head screw driver, or preferrably a drill with a phillips head bit; 2) a hammer; 3) a pencil. 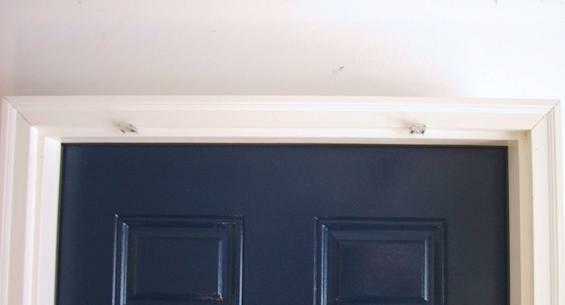 Take one clip and place it up underneath the top doorframe. 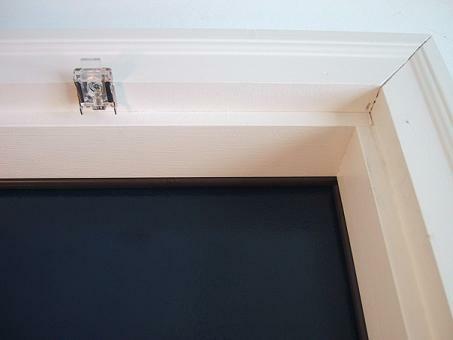 Place the clip a few inches from the side of the doorframe. The exact distance from the side of the doorframe doesn't matter, just make the two clips about equidistant from either side to make it look neat. The clip must be at least one pencil width (1/4 inch) in front of the the jamb, preferrably more. This is so that the housing will have room to snap in easily. Place the pencil lengthwise against the jamb, and the clip should back up against it. 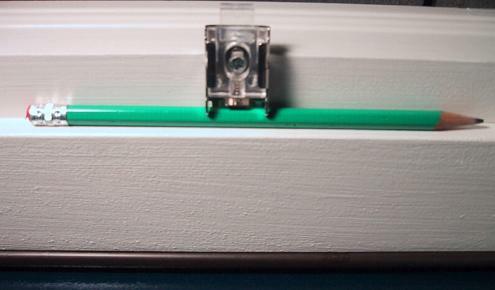 (Picture 1) If there is more room, move the clip to the front of the top door frame so that only the clear plastic release tab sticks out. Put the screw in the hole of the clip. Give it one tap with the hammer to get the screw started. Not a hard tap, just enough to get the screw to stay in place without holding it. Now take the screwdriver or drill and screw the clip down tight. Remove the pencil. Repeat with second mounting clip. 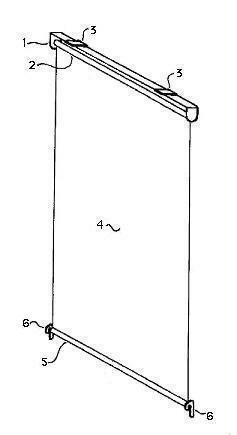 The hold-down hooks will be installed at each bottom corner of the doorframe. Take one hook and hold it flat against the side doorframe. Place the long flat side again the door jamb. Keeping it in this position, slide the hook all the way to the bottom of the side doorframe. When you've got it in place, hold a screw into the hole of the hook. 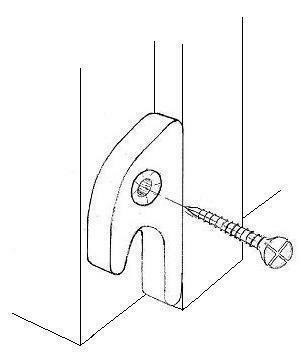 Give it a light tap with the hammer so that the screw stays in place without holding it. Now use the screwdriver or drill to screw the hold down hook tightly. Repeat with the second hold down hook, making sure they are the same distance from the ground. 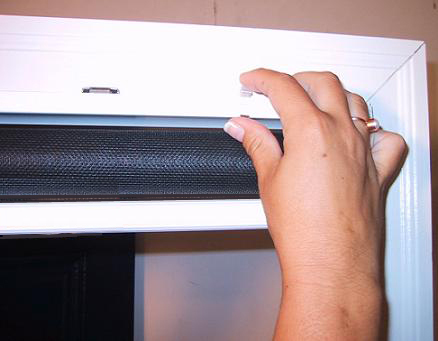 Take the screen door main housing in hand, face the doorway from outside, and hold it so that the screen unrolls on the inside. You want Secret Screen situated so that the place where the screen material unrolls from the spring roller is up against the door jamb. 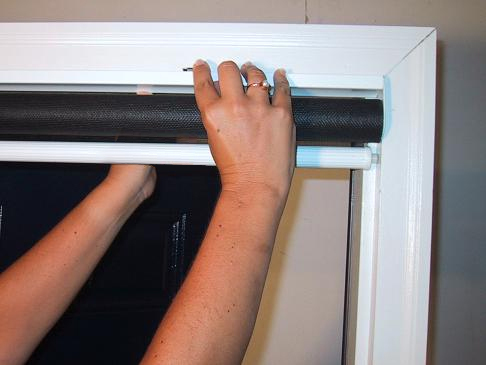 Place the back of the top rail underneath the top doorframe, against the door jamb, behind the mounting clips. Push the back of the top rail up into the gap between the door jamb and the mounting clips. At the same time, hold in the tabs on the front of the clips so that the top rail will slide over the front of the clips. You will feel it snap into place, then release the tabs. The valance clips fit over the front of the top rail. Place the valance clips on the top rail, one near each end. Take the valance and locate the channel attached to the back. Place the top edge of the channel into the valance clips, and then press the valance in until the clips snap into the channel. It is important that Secret Screen fits snugly in your doorway, so make sure that you have ordered the correct width. 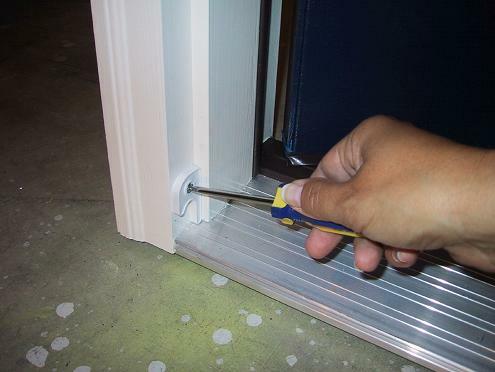 To prevent bugs from entering, the screen material needs to be as close as possible to the sides of the doorframe. If there is more than 1/4 inch of space on both sides of the screen, or 1/2 inch total space, your screen is not wide enough. If you decide that your screen does not fit your doorway properly, exchange it. Before you take it down, determine the exact width that you need and write that on a note to be placed in the box for our reference. Leave your mounting clips and hold down hooks installed so that you need only snap in the replacement you receive. Send the screen door main housing and the valance back in the same box. Upon receipt of your screen, we will send you a new one that's the correct width. Occasionally during shipping, the metal brackets on the ends of the main housing get pushed in so that the screen can't roll up freely. You can bend them back out so that the screen can roll up again. If that is not the case, there is a slot on the side of the screen main housing where you can either increase or decrease the tension of the screen. Take a large flat head screw driver and turn it clockwise (right) to make the screen roll up faster, or counter-clockwise (left) to make the screen roll up slower.